The Southeastern Line will be a bus rapid transit (BRT) system rolled out in stages. Initially it will connect the airport with Puhinui station, which is on the Southern Line and the Eastern Line. It will then be extended to Manukau, Flat Bush, Botany and eventually Howick, all within 10 years. 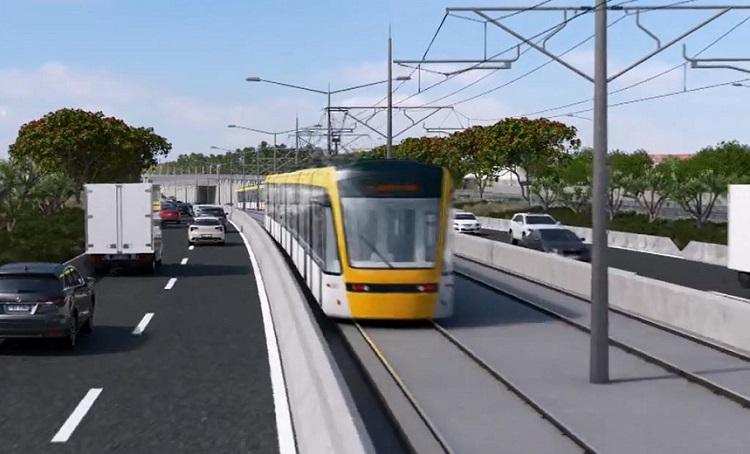 You’ll be able to travel from the city centre by heavy rail on either the Southern or Eastern Line – a half-hour trip once the CRL is open – getting off at Puhinui and transferring to the Southeastern BRT for a 10-minute trip down the busway to the airport. Total travel time: about 45 minutes, including transfers. If express trains are running from Pukekohe and Papakura to Britomart, a stop at Puhinui would allow an even quicker trip to the airport. So, coming from the CBD, you’ll have two options to get to the airport: the City Line light rail, or the Southern or Eastern Line plus Southeastern BRT. But for me, the best reason to build the Southeastern Line is not its central city connection. It’s the same reason I have campaigned for it for the last six years: it will allow me (and the other residents of Papakura, Takanini, Manurewa, Drury and Pukekohe) a direct transit route from any of the Southern Line stations south of Homai to the airport, with a single transfer at Puhinui. No more getting stuck on the roads like last Friday, when it took 75 minutes from the airport to Takanini! The Southeastern Line also links up southeast Auckland (Botany and Howick) to the airport and Manukau, giving them a car-free option for the first time. For those closer to Manukau itself, catching a feeder bus to Manukau then transferring to the airport bus, will also become an option, with better travel times than the current 380 Airporter bus. 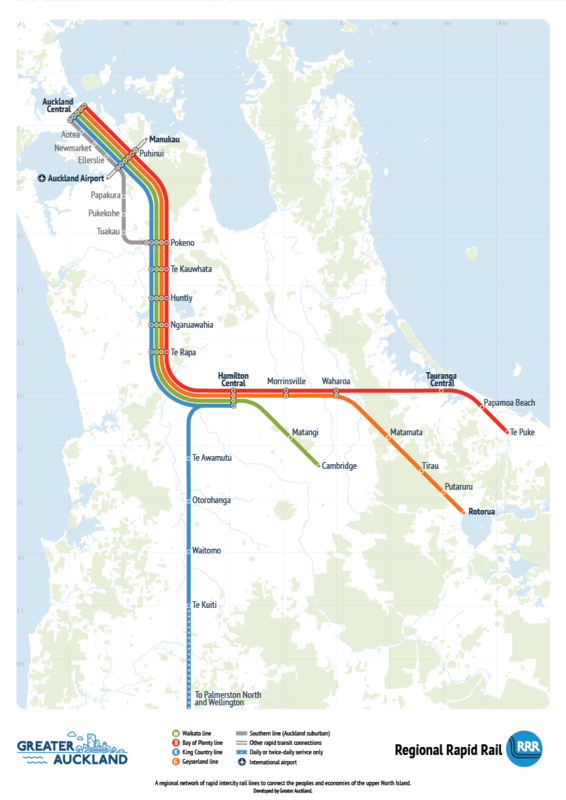 Below is a detail from our recently released Regional Rapid Rail proposal (this is a schematic not a map, please don’t fuss about the background) highlighting the potential of this currently very humble point on the Auckland rail network. The Puhinui transfer means that every southern and eastern line train can have an airplane symbol next to it, but it also makes every intercity train from the south is also a; train to the planes. Furthermore, because with the now funded additional track on the Auckland network, new intercity and express services will be possible, reducing journey times from Britomart to Puhinui Station to as short as 16 minutes (non-stop as envisaged on intercity services). From Puhinui Station to the Airport should take about 6 minutes, so allowing a little time for the connection, rail to the airport on this route should routinely take around 30 mins from the city centre. And very very frequent, with a train at most every 5 minutes, and an express (inter-city) at least every 15 (7.5 mins at the peaks). With the Regional Rapid Rail, and the Third and Fourth Mains in place the trip from the City to the Airport via the Southern Airport Line would be around 30 minutes compared to the Northern Airport Line’s 45 minutes. So for those asking about an express service to the airport there you have it – the Southern Airport Line. I agreed southeast rail link to airport should be first piority however design airport station as a through station and not a terminus. Ie don’t make same mistake as Britomart.